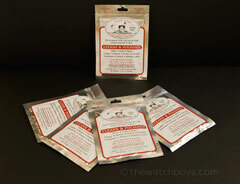 Cape Cod® Polishing Cloths (5 Pack) [cc_5pack] - $29.99 : The Watch Boys, Providing quality products for watch collectors! 5 Packs, with 2 reusable cloths (10 cloths total). Cleans and polishes: silver, gold, brass, copper, bronze, nickel, chome, aluminum, pewter and stainless steel. Ideal for polishing and removing scratches (superficial or deep) on your POLISHED finish watchcases. Simple to use, pre-moistened cloth, with micro-abrasive that takes minimal expertise and time. Produce a professional shine without the high cost.